It has been debated for a long time: how cold does it need to be before you stop riding? Since winter is upon us I figured this would be a great topic to bring up. Although some states don’t get nearly as cold as us here in Ohio, this is still an interesting topic with good information to know for any horse owner. Most articles and forums that I went to said that the temperature would need to be around 10-15 degrees Fahrenheit to be considered “too cold” to ride. Have you ever gone running outside in the middle of winter? I jog occasionally, and I always avoid running outside in the winter. Mainly because after about 15 minutes the cold air starts burning my nostrils and my lungs feel like they are on fire. Breathing in all that chilly air doesn’t feel good and horses will experience that same feeling when being worked really hard in the middle of winter. This is why even when it is only 25 degrees outside you should never work an unconditioned horse really hard. The workouts should be simple and you should never work the horse hard enough to cause excessive sweating. Just like any athlete you want to make sure to do a nice simple warm up and a long cool down. These can be simple patterns or alternating jogging and walking. After a nice workout, you always want to make sure that the horse doesn’t have access to cold water for a while. This could trigger a colicy horse, and if your horse is already prone to colic it could be very dangerous. Another big problem can be where you are riding. Most people will have access to a nice dirt or sand indoor arena, which is perfect for winter riding. Other equestrians, however, do not have the luxury of an indoor arena. When riding outside there are a few things to remember. First, you need to be cautious of ice, especially if you have a horse with shoes on. Ice is slippery in the first place and when you add some aluminum horseshoes to the mix this only adds to the chance of a fall. Second, you want to make sure that the snow doesn’t get too packed up in the hoof. This can cause pain in the hoof, and if your horse already has hoof issues occasionally, this will only add to the pain. Lastly, and probably most importantly, is that if the ground is frozen, working your horse on hard frozen terrain can cause injury to the tendons and ligaments. Imagine yourself running on the concrete with just your socks on, I don’t think that would be real comfortable, and that’s what your horse would be feeling. In conclusion, you need to think about yourself too. Don’t ride if you are not comfortable in weather this cold. You always come first, and being outside in the middle of winter can cause illness. 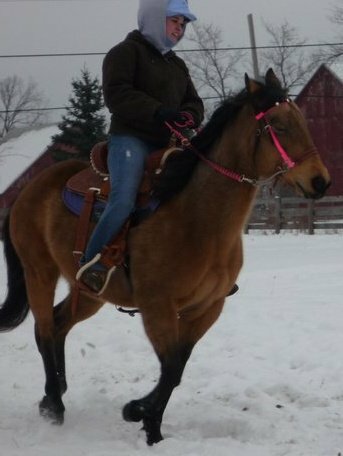 If you feel that it is just too cold but you really need to work your horse, do some lunging. This is simple, and will still condition your horse and keep them in tip-top shape! Always do things as safely as you can, and remember to wear a helmet when riding. It has been proven that during the cold season you are not as alert. A helmet could save your life. I hope this insight into the coldest season of the year helps all you horse lovers more aware of the dangers of riding in severe weather. Feel free to comment and leave your feedback! It is always nice to hear from other equestrians. 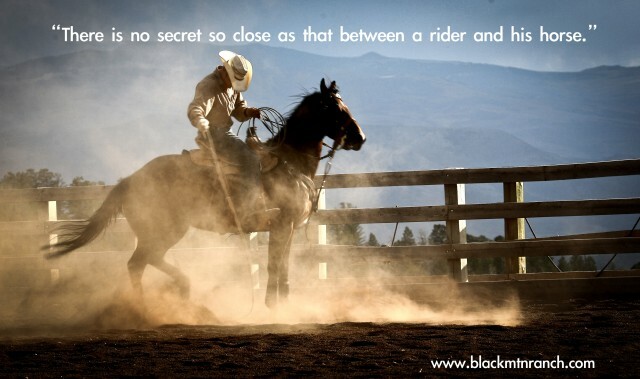 Creating the unbreakable bond with your horse is critical. We have all had a horse at sometime that we feel that strong connection. You can read each others minds, and know exactly what the other one is asking for. When you have a riding session, always end on a good note. Don’t push him to hard, but when you are nearing the end of the session and you ask him to preform a task and he responds well, end on that note. He will realized he’s done exactly what you want and he will be rewarded by being unsaddled. I always recommend grooming your horse after a nice long ride. This again will give him a nice little reward after a riding session, plus its relaxing for him and keeps him clean! Horses can sense our fear, even if you feel a little scared pretend that you know exactly what you are doing. He will then sense your confidence and note react so negatively. Always be cautious when around any horse. Like stated before horses have a mind of their own and can spook at the most random times, and this can put you and the horse in danger. And remember…its always better to be safe than sorry!